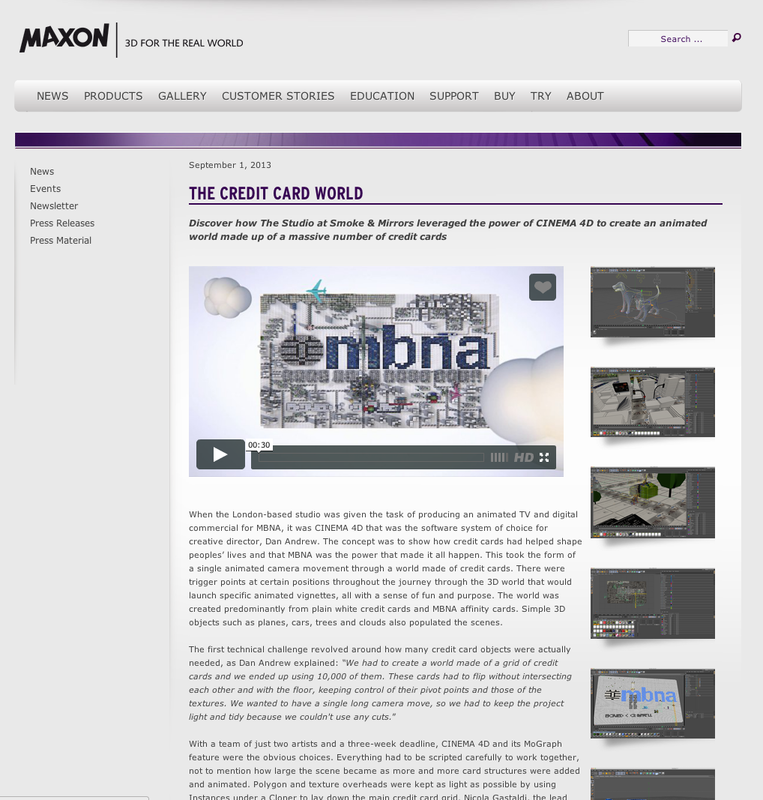 We’re featured on Maxon website because of our MBNA commercial. The lighting system used throughout was GI, though this gave concerns that the system, a twin Mac Pro (3GHz dual-core Xenon) with 45 render clients, wouldn’t be able to cope with the 15k polygon scene. With 30 seconds of animation at 1080p, it made for a lot of rendering. Still, using Net Render, the render time of each frame was kept to a reasonable level, with around a minute for the simple scenes, and up to 45 minutes for the complex ones. Then, just as The Studio at Smoke & Mirrors thought it had been nailed, on delivery day the client wanted to change the main texture on the credit card throughout the whole video. Thanks to the way it had been set up in CINEMA 4D, it was very simple to implement the change, then sit back and wait for it to take another 12 hours to render again.